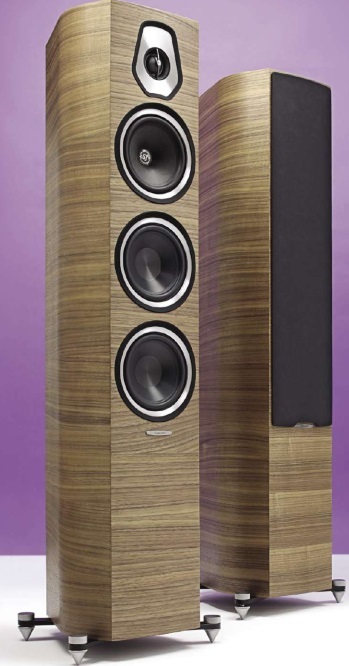 Noel Keywood listens to Sonus Faber sonetto Ill loudspeakers. A small floorstanding loudspeaker is arguably the best compromise between size and performance in loudspeakers. They’re not so intru­sive, especially when wall stand- ling, but you get a big sound. That means clean deep bass to add heft and scale to a performance. It’s a popular sector every manufacturer aims to cover in their product range and Sonus Faber (Italy) weigh in with their slim, elegant Sonetto III model that I’m reviewing here. No end of letters we receive ask about room matching and loudspeaker manufac­turers actually do a good job here but they don’t broadcast it well. I could tell when measuring the Sonetto Ills that they’re designed for an ‘average room’ of the sort most of us live in – that means 14ft-18ft long. Sonus Faber have bigger models for bigger rooms. Yep. I am being bleakly simple. Best to be because the subject gets very confusing very quickly! Too much equivocation is the result I’ve designed such loudspeakers, know the issues and am fascinated to see how other designers tackle it. Sonus Faber get a lot well sorted in their Sonetto III, conspicuously in bass control – the bit that excites potential buyers. This ‘speaker is a small move ahead in delivering tuneful bass, free from the inflation and waffle that large ported loudspeakers are accused of. But it gets all else right too, ticks all the boxes and sounds great as a result. So on to specifics. The Sonettos use the tried and trusted formula of a bass/midrange unit just below the tweeter at top, crossover over between them being at 3kHz, in line with common practice. Below sit two bass units that work below 200Hz to handle deep bass, making this in effect a three-way design. A large port fires downward to the floor, clearance above it being provided by the stabilising feet and their spikes. The cabinet stands 1018mm high – the usual 1 m or so – and it’s 219mm wide and 301mm deep. In Imperial, 40in x 9 in x 12in. A high-ish weight of 16kgs (35lbs) makes them sit firmly on four pedestal type feet that are screwed into the base. The feet have height adjustable spikes that serve not only to keep the cabinet well anchored and stable, but also provide clearance for the port that provides acoustic damping of the twin 150mm aluminium cone bass units. If you’d rather not see the driver array there are black fabric grilles, held on magnetically. A terminal panel carries sturdy gold plated bi-wire terminals with links for mono-wiring. Bare wire, spades and 4mm banana plugs can be used. The Sonetto looks attractive but the veneer finish is uniform in appearance, having a simple repetitive pattern. Sonus Faber’s 29mm fabric dome tweeter has a frontal phase plate to suppress peaking, and an attractive alloy surround. The fibre- pulp midrange unit sits below, a small badge acting as central dust cap. I chose to use our Creek Evolution 100A amplifier to drive the Sonettos, since it is powerful but smooth – and reasonably representative of what they would be driven by in practice. An Oppo BDP-205D Universal Player span CD and acted as a source of hi-res digital, fed from an Astell&Kern AK120 player. Connection was through Chord Company Signature Reference loudspeaker cables. Conveniently standing nearby was the Icon Audio Stereo 300B MkII valve amplifier that I could not help but connect up also. OK, it might not be a typical amplifier but I sensed it would suit. With the Yuri Honing Trio’s Walking on the Moon, hand drum strikes were vividly clear and forward, and the sparse instrumen­tation picked out well against a clean background. This track illustrated a dry and composed delivery from the Sonettos, but also one starkly outlined. As I worked through a wide range of uncompressed CD review tracks it quickly became obvious there’s great vocal projection here, from Renee Fleming singing Madame Butterfly to Holly Cole and her laconic Train Song; I could hear their every murmur and the finest intonations. It was like listening through an acoustic magnifying glass. The dry quality came about largely through lack of any colour – an almost cold tonality – and a strong grip on bass lines. For example, plucked acoustic bass behind Elvis Presley singing fever stride along with a sense of clean ease. There was no surrounding ‘warmth’, more intense insight into the instrument that well revealed its timbral properties; the Sonettos added no flavour of their own. With Patricia Barber singing Let it Rain sibilance was a little emphasised by the tweeter but her vocals were sharply defined in front of me. The ’speakers image with precision and set up a wide, forensically defined sound stage, vocals thrown forward. As I expected the high resolution and firm deep bass were a perfect match for Icon Audio’s Stereo 300B Mkll amplifier. The L Sensitivity setting added subtle but complementary bass heft whilst the openness of purity of the 300Bs was well conveyed. Don’t begin to think warm or romantic so much as sharp and fast, punchy yet with a sense of bass grip and tunefulness hard to come by. The big spacious sound of this amplifier was well conveyed by the Sonettos; they are revealing of source. The Sonetto is a high resolution loudspeaker for a typical medium sized room. It is dry, projective and informational. Sonus Faber have engineered it well to give an accurate sound tailored for medium sized rooms where it will impress any listener. Worth hearing without a doubt. Tall slim rear shape, held stable by out-rigger feet. Bi- wiring is possible. Our analysis of frequency response, using third-octave analysis of pink noise, shows an impressively flat characteristic extending from a low 45Hz up to 10kHz within very tight limits. The tweeter peaks up sharply above 10kHz and, having wide dispersion, there was little difference off-axis. This will add a little sting to the high end. Lack of an upper midrange dip at crossover will be subjectively obvious as effective delivery of detail. Also, the smoothness of response is due to a lack of local resonances in cones and low colouration as a result. This means the Sonetto III will be neutral in its sound. It’s common for small floorstanders to have some upper bass lift to add warmth and body, but the Sonetto III lacks this and will sound relatively dry and lean; it is best used close to a rear wall to enhance lows. Lower bass is both smooth and well extended downward. The large downward firing port provides extra bass output (red trace) around 40Hz. Use of a crossover compensation network results is a perfect resistive load of around 5 Ohms – easy for an amplifier to drive as there’s no reactance and energy storage. 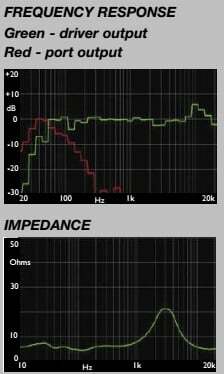 Bass extension and damping are good (red trace), so note resolution will be excellent down to lowest frequencies. However, this is not a bass heavy loudspeaker: it’s tailored for medium sized rooms (circa 16ft long) and near wall placement, then bass will be in balance. Sensitivity was very high, 90dB sound pressure level (SPL) produced from one nominal Watt (2.8V) of input. Amplifiers of 20 Watts per channel will go loud with these ‘speakers. The Sonetto Ills are well engineered but the tweeter peaks up, creating obvious treble. A dry yet insightful loudspeaker with tight, fast bass. Accurate and impressive.